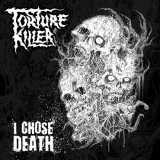 Torture Killer has spent the last decade making their name as one of the most stoic curmudgeons of the Finnish death metal scene. Rooting their style (not to mention their name) in Six Feet Under-style mid-tempo death churning, they break a three-year recording silence with this defiantly old school EP containing two originals and a cover of an even-oldier from Finnish dm-pioneers Demigod. Opener All Will End In Terror is the kind of straightforward chugfest that should get any given deathhead banging that head for a duration but I gotta say that there’s not much special present. New mic man Pessi Haltsonen has a very serviceable guttural grunt (think Corpsegrinder but not quite as powerful and diverse) that takes care of the gravelslinging well. The cover track Succumb To Dark fares better with a peppier tempo shift, a very quick bass break, hints of searing melody (don’t worry you hairy brutes, nothing Gothernburgish) here and there. Still a tad monotonous but not shabby. The upward curve is maintained with the closing title track which quite frankly is great! The foreboding lead guitar intro surges into a heady, slightly punkish gallop that drives the tremolo picked sawblade-riffs very nicely. Double bass drums! Insidious melodies once more! Morphing into some sweet neck-heaving grooving, too. Atta boys, I knew you had some versatility in here. The production value is overall good, punchy with the kind of gruffy, raw edge and lack of polish that you would expect from material like this. I could’ve used a little more chunkiness with the bass or so but I guess this comes with the territory. All in all, Torture Killer’s new EP offers both the mediocre blandness that mid-tempo death metal often is scolded for and some sweet deviation from that norm. Well worth checking out, at the very least.